How an efficient and effective Change Management or Transformations can be achieved in any company? I have published this post on LinkedIn and had a very good response and discussions from industry experts and business pros. Check it out here and connect with me on LinkedIn. Property of Sriteja Reddy Wudaru. Contact me if you want to use or build on the Framework. Change Management or Transformations can be achieved in any company.Change Management or Transormations can be a daunting task for any company in any industry. But, with growing competition, recent recession, and the customers being more informed, companies need to transform themselves into a better players if they want to stay in the field. Starting from the Board and the CEOs until the Managers and the floor employees, everyone need to understand the importance of an efficient Change Management and strive to implement the same. I have done a consulting project for one of the three largest banks in the Netherlands, and a prominant bank in the Europe. I had two other colleagues with me and we have analyzed and recommended certain strategic steps for the Private Banking wing of the said bank. As a part of the 3-month project with them, we have developed a Framework for an effective Change Management based on which we have made the recommendations for the bank. The Board, the CEO, and several other employees have mentioned that they had found these recommendations useful and they are actually implementing some of them. I have decided I would share the Framework with anyone looking at transforming their company, however small or large it might be. Testing the current strategy and its effectiveness against the results, market trends and projected future shifts in the industry. Assessing the implementation of the current strategy and identify the disparity in the intended direction and the direction in reality. Recommend a Change Strategy that addresses these critical issues and pave the way for a successful change for the company or the product line or even a single department. This stage focuses on the WHY of the Change; why does the company want to change? There should be a balance between the intentions of the management and the aspirations of the stakeholders. If the intended change, even if achieved, does not address the needs and meet the expectations of the stakeholders, then such a change is unnecessary. In this context, this stage also focuses on if the intended change is a result of internal realization or the public pressure and trends in the market. The first question against which the intentions to change will be tested is, if the intended strategy is a market targeted or designed to beat the market and the competitors. A market targeted strategy only addresses the current trends and fails to project the future potential opportunities. But a strategy that is built to beat the market explores all the alternate methods and exploits every resource at hand to ensure a sustainable growth into the future. The second question to ask is, if the company considers its key competitive advantages and incorporate them in such a strategy. These key skills may include employees, technology, market share, loyal client base or even a better value proposition of the products. The third question to ask is, if the company has a well-defined and right target groups. These target groups should be identified as the suitable ones for the company or its products and both, the top management and the employees, should believe so. This stage focuses on the WHAT of the Change; what are the areas that need to be changed? Trying to change a lot of little things slows down the process and derails the intended strategy. So, priorities should be defined in terms of which areas to focus on, which key people to involve and which change processes to set up. These priorities should be few in number but have a huge and definite effect on the organization as a whole. To maintain the balance between the intentions of the management and the aspirations of the stakeholders, as said in the previous stage, it is very important to involve stakeholders in decision making in this stage. The first question against which the priorities should be tested is, if the right trends in the industry are considered that enables to define priorities which when changed puts the company ahead the industry trends. To ensure this, both external studies and internal insights should be used. So, the second question is, what are used? External studies are accessible by the competitors also. But the privileged insights gathered by interviews and interactions with employees, customers and stakeholders, give the company two advantages. Firstly, it gives the company information which is not accessible by the competitors. Secondly, while external studies only gives a picture of the industry as a whole, internal insights shows the gaps that exist between the company and the industry. The third question to ask is, if these studies take into consideration the uncertainties in the market or the complications that may arise in the future that may deflect the direction of the company? The fourth question to ask is, if there is any sort of bias from the top management? Any priority defined or decision taken should be free of the top management bias and selfish intentions. This stage focuses on the WHERE the energy comes for change; is it from the internal realization that they should change or adapt a new strategy to be more sustainable in the longer run or is from the external pressures such as from the Government, the market or the competitors. More importantly, besides identifying this source of inspiration for the change, this stage also deals with the momentum of the change. It is very commonly observed that a very effective strategy developed by a company is easily derailed as some complexities arise in implementing it. These complexities can be a shift in the market, inflation, change in the Governmental regulations or change in the key management people. To avoid this, there should be continuous management of momentum to pursue this change strategy. There should be dedicated systems for training, monitoring and reporting these systems in place. The first question to ask is, if there is a balance between the commitment and flexibility of the strategy? The employees and the top management can be very committed to the change, but is it enough flexible to address sudden complexities that may arise? If not, it will fail to address them. If there is a lot of room for flexibility, the employees and the top management can lose focus and commitment and the strategy fails to address its core functionality. This stage focuses on the HOW to communicate the strategy; to both the employees and the stakeholders, collecting feedback, making adjustments and advertise the outputs. The first question to ask is, is there a conviction from the top management towards this change management? Is this conviction reflected in the actions of the top management that can induce motivation in the employees? With this conviction and motivations, is there an action plan that efficiently integrates and implements this change management in the core businesses? All of this is possible by the continuous feedback from every employee involved in this change management, may it be employees, managers, clients or other stakeholders. All of this is possible only if there are continuous negotiations with all the stakeholders involved in the change management. 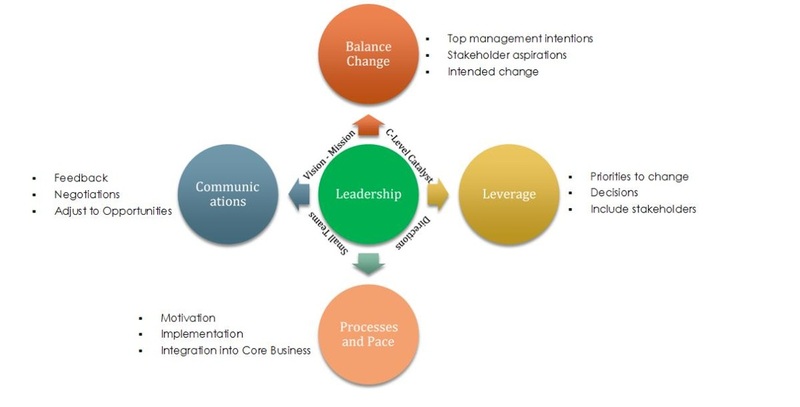 This stage deals with the WHO should oversee all this change management; the C-Level Executives or the top management should act as the catalyst for this change. Even though this is last stage, this is the heart of this framework and binds all the other stages into the strategy. The mission and vision should be communicated to the employees and motivate them. It is their responsibility to set realizable goals and provide directions on how to achieve them with enough flexibility. It is also their responsibility to communicate this to all the employees. Besides the C-Level Executives, small cross-functional and responsible teams can be set up to dedicatedly work on monitoring and implementing such a strategy. The first question to ask is, are there dedicated systems that monitor and implement such a strategy? Are the mission and vision of the top management communicated to the employees? This framework has definitely helped us evaluate the current practices of the bank, analyze the trends in the industry and practices of the competitors, and come up with a strategic plan to implement much-needed change in the bank. The fields we have used this framework were Private Banking, Wealth Management, Investments, all financial related fields, and their overlapping with the recent trends of Corporate Social Responsibility of banks. It has helped us. I am sure it would help you too. For more information on the framework, a detailed description, or about using the framework in your company, articles, or any publications, please email me. I would be glad to share my knowledge with you. I believe, ‘By sharing knowledge, you increase it’. Join list now to get updates on Digital/Online Marketing, Branding and Business Strategy. How many times have you talked about an awesome customer service you have had and how that had made your day? However I would bet that you have spent far more time talking about your poor customer service experiences because it seems to happen far too frequently these days. To you. To me. To a lot of people. Don’t our customers wish to be treated the same way we would if we were them? What does it take to either provide the awe inspiring best-in-the-world customer service or ruin the whole experience? I looked at the companies that stand out with their customer service. They provide the best possible experience to their customers not just in the process of purchasing a product or service but even after the purchase. A very few companies have scored a 100 on 100 every time on customer experience. Mostly it is not just the people who are at the counter or on the other side of the phone, but it is the culture of providing the best service and experience that is inscribed in the very DNA of the company that enables this. Recently an influencer I am connected with on Twitter posted her experience of best customer service (full details at the end of this post). That had triggered the thought in me to share my insight with you. And here it is. Read full post on LinkedIn here. Sometimes Customer Service is at the core of the culture. Companies that have been set up with the sole goal of making money would reek of the culture of selfishness, individuality and making a sale. Companies that are set up with the customer in mind and the determination to solve their problems would radiate inspiration, the spirit of community and providing value to the customers. For companies, wealth should be more than money. It should be the customer satisfaction, service to the communities and the value they provide. How would you want your customer to remember buying something from you? Ask this question and you provide the best experience your customers could have. Sometimes it is, in fact, just that one person — A short real story. Word-of-mouth marketing is the best marketing a company can have. Provide great service and turn your customers into your brand ambassadors. It is all about experiences — Warby Parker is not about glasses. It is about cause. Coca Cola is not about drinks. It is about happiness and the fun in sharing. This is the part 3 of the 3-part series. Read part 1 here. Read part 2 here. In any field, be it politics or business, competition plays a vital role in company’s strategic decisions. No company can say that they decide their strategy solely based on their own performance metrics. They simply HAVE to take competition into consideration. Companies take competitors into consideration to make strategic decisions. Modi’s campaign was planned more than a year ago. Data — large amounts of data — was collected and analysed. There was a team for analytics, another team for planning, another for social media branding, and everyone was involved. He orated in events like Google Big Tent and showcased his popularity in events like India Today Conclave where he talked about Gujarat Development Model in detail. When it seemed like the Congress party was gaining grounds in Uttar Pradesh, Modi’s team had taken steps. Uttar Pradesh is so strategically important in Indian elections that it is often assumed that the party that gets highest number of Parliamentary seats in this state would form the Government at national level. With the data they had, Modi’s team had come up with a plan on short notice that made Modi so formidable in the state. The National Digital Operations Centre in the party’s Delhi HQ updated the schedule on Facebook and Tweeted about Modi’s new schedule. The App India272+ was updated too. Within no time, the total 2.5 Million active volunteers working for Modi’s campaign across the country were updated with the new developments. By the time Modi gave his speech in Uttar Pradesh, mainly a constituency named Amethi from where the prime minister candidate of Congress, Rahul Gandhi, was contesting, an 8 minute video showing the backwardness of Amethi was circulating on YouTube and being Tweeted extensively. The tweets, the video and the updates added a 360 experience to this campaign. Such was the planning that went behind it. Nevertheless, in spite of such vigorous planning and execution, Congress had won, once again, from that constituency. This example only goes to tell us that, even with extensive analytics and big data, planning and efficient execution of tactics and strategy, companies may face challenges from the competition. Then, it becomes even more important that companies try to restrict these challenges as much as possible and try to turn them into victories. When Congress commented on Modi asking him to go and sell tea like he did before he came into politics, he even turned that to his advantage. BJP launched a unique program Chai pe charcha, meaning Discussion over Tea which was carried out on 4000 locations. ‘’I used to sell tea on trains, I know how hard it is to make a living’’, said he clearly indicating that he has utmost respect towards even the overlooked jobs. This has stirred a lot of response in people that tea sellers started quoting Modi and his pictures appeared on tea flasks and pots all across the country. Authenticity is most probably the most important trait any company can have that would retain loyal customers. Modi has shown the traits throughout his campaign, though in many instances, that can be doubted. Modi clearly has his past of religious affiliation working against him but he tried to change the perceptions of the voters with his new strategy of focusing on development. Whereas Congress was still using communalism and secularism as its main weapons, Modi moved on to development. While Congress played religious and geographical politics, Modi used the country’s development as his goal. Congress helped Modi a lot in winning by not being proactive and engaging with the people in its campaign. Modi has tried to be authentic in his talks about development. He has tried to be authentic in his commitment towards the voters. Whether all that was real and whether that has affected his victory is based on everyone’s own perception. We are already aware that, in today’s world, companies need to be proactive. They need to address customers’ concerns before someone somewhere tweet about the bad customer service experience they had had. Companies need to communicate clearly before a post rose out of misunderstanding appear on the company’s Facebook page. Clear information helps customers, investors and employees of the company. I have seen companies where even the employees did not have clarity on what strategic considerations and goals of the top management were. 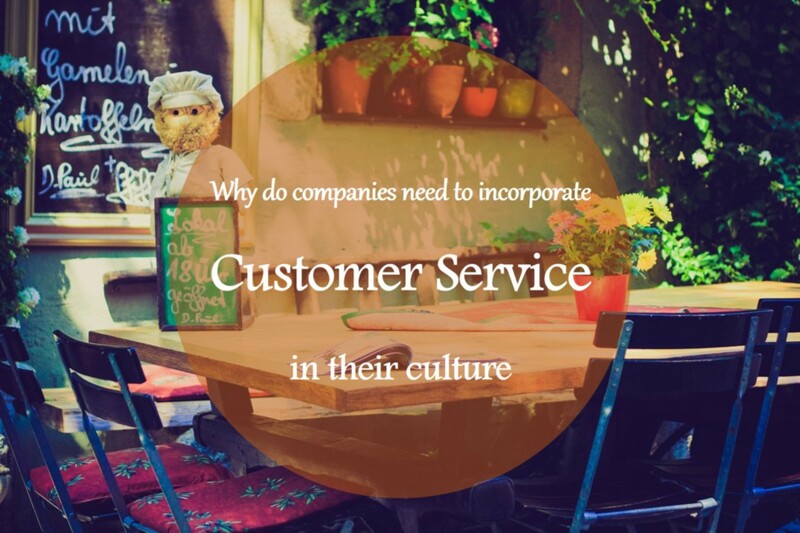 If the employees themselves are not clear, what can companies expect from the customers? If you are strict regarding the usage of child labour or labour exploitation, show it. If you do not use sweatshops, talk about it. The recent release of the list of companies that use sweatshops has caused quite a stir. If you are against it, this might be the right time to show it. Authenticity is a must for companies to retain loyal customers. Consumers want to be associated with the companies they believe do not get involved in exploitation, discrimination or unethical business practices. Be proactive in communicating about your business practices. Be authentic about them. There is nothing more powerful than loyal consumers. There is nothing more important that engaging with them and showing them that you adhere to your values and win their trust. Companies should engage with customers authentically and communicate business practices and values. Narendra Modi, one of the most controversial leaders in India, has managed to create a personality cult in just a year. This shows how different aspects of planning, communications and engagement with customers can help businesses establish themselves as the best in their industries. But, with this glorious sweeping victory, Modi has raised expectations in everyone, in the country and in the rest of the world. Can Modi live upto these expectations is a question that is pondering over in everyones’ minds after one month of his coming to power. A lot of responsibility lies on his shoulders now. To do what he promised to do. To show in actions what he had said in words. To make his promises reality and develop the country in a way no previous leader has done. Can he live upto it — Will he live upto it — is a mystery we all have to wait and see. Managing expectations is vital for companies. Underpromising, overpromising, both are risky. Talking about expectations is always challenging for any company. You under promise something and you do not raise enough interest in your customers. You overpromise and you run the risk of under delivering. We have seen these trends mostly in tech environment where companies promise awe inspiring innovation and fall flat on delivery or promise world changing technology and show something that is merely an advanced version of an existing technology. This can be easily managed with enough market research and asking the consumers what they want and what they expect from the companies they love. Whatever may be the field, companies need to live upto the expectations of their customers thereby keeping up their loyalty and interest in the company’s products. Consumers tend to expect more and more every time a new product is announced or a new update is released. These expectations can be easily controlled by effective communication between the companies and their customers prior to the release of new products or features and by engaging with the influencer groups within their customers. Social media has made it easier to engage with the consumers today and companies are already using its power to talk about the new rollouts even before they are actually rolled out. This article has been written from the perspective of business management. If you have found it interesting and useful, please share it with your networks. Let us build better businesses. You always have a choice. No matter what, there are always two roads that lead through the forest, as Robert Frost had said. You may or may not know the consequences of taking either of the road. You are equipped with your past experiences. You have the most complicated computer with you— your mind. You have a heart that adds the emotional aspect to your decisions. You will take one of those roads; you just have to. Life does not go on if you are standing there, at the intersection of two roads, forever. You have to make a decision. You have to take the first step. You have to decide and pick one of those roads. But again, you do not need to do that blindly. As I have said, you always have a choice. Turning your back is not always bad. You may think that running away is a symbol of cowardice. No, it is not. In fact many people run away from problems everyday. Soldiers in wars. Fire men in distress. Even presidents when they have to take a stand on some particularly tricky issue about the country. They all do. But they will all return when the time is right and the circumstances have changed, often for good. They all return to take a stand and make a point in history. They all return before it is too late. Turning your back and running away is not a symbol of cowardice. It is a proof that you understand the risks and that you are running away only to return with new energy and experiences. You just have to know and believe that you are not running away because it is an impossible problem to solve but because when you return, you will be able to solve it easily and more efficiently. Trust your friends, the real ones. We all make friends, several of them, even thousands, in our lifetime. We make friends when we are in primary school. We make friends when we are working. We make friend that guy who serves us drink every evening in the pub near our workplace. We make friend that girl who travels with us on the metro every single day. When the time comes when we need them, or they need us, do we always understand who the real ones are and whom we can trust with out lives? Those who party with you and disappear when you really need them — no, we do not need them. But the real ones are those who sit with you on your porch and let you keep your head on their shoulder and cry at two in the mid night — now, that is someone we need. And you will definitely find them or you already did. And when you do so, make sure that you never, never ever, leave them when they need you. Courage and fear go hand in hand. Not always not everyone can be courageous. Fear is an integral part of who we are. Fear is there within us. We have to have respect towards fear. Fearing is not being unable to overcome a hurdle. Fearing is not running away leaving the people who trust you behind. Rather, it is exactly the opposite. It is standing there, stern on your feet, and facing the problem eye to eye. It is showing those people who trust you that yes, you are scared, but you are going to fight until your last breath to overcome the hurdle. You are going to fight and win. You are going to win with courage and also with fear because, as there is no light without darkness, you cannot experience courage without making friends with fear. Harry, Hermione, Ron and many others in the Harry Potter stories have shown different qualities that reader/viewer can relate to. If you have more lessons that you have learned/noticed in the stories, please feel free to comment and share. This is part 2 of the 3 post series. Read part 1 here. It was a very painstaking campaign carried out at a punishing pace with Modi sometimes addressing as many as 5 rallies a day. For such a vast country with so varied geographies and demographics, campaigning successfully is in itself a challenge which Narendra Modi and his team had successfully taken and emerged victorious over. The young team behind the social media tactics and the experienced people who planned the whole campaign went through months of sleepless nights and took care that even the tiniest aspect of the campaign had been planned to perfection. Whether it is a political campaign or a business, such passion, commitment and hard work is required to succeed in today’s competitive environment. The customer landscape is changing every day. Everyone is aware of what is happening even in the most remote locations on the other side of the world. Customers are seeking out companies whom they can trust and invest in both financially and emotionally. They need companies to be committed towards their values. This is ever more important with the increasing importance for Corporate Social Responsibility (CSR) in almost every industry today. Customer does not want to invest in a business only to see later that the business is polluting the environment or causing disruption to the lives of the people in some country. Customer wants the business to be ethical, responsible and accountable. Customers are seeking out companies they can trust and invest in both financially and emotionally. I have myself seen the problems that arise if businesses do not commit themselves towards their values. I have consulted for a renowned financial institution and was surprised to notice that even the organisation’s own employees are either not fully aware of the values of their organisation or do not believe that their organization is committed to their values. This has resulted in the employees not being fully connected to the company’s values. Procter & Gamble, Unilever and Coca Cola are just a few of several companies that have realised the importance of commitment whereas the issues being faced today by several financial consulting and banking companies would be lessons for other companies. Both customers and employees want to be associated with companies that commit towards their ethics and values. After a product that solves the problem or addresses the need of the customer, if there is one important thing in today’s world that companies have to embrace, that is communications. Communications do not merely imply news, updates or information shared with the customers. That is why I added Engagement in the heading above. Engagement implies being connected to customers. Having a dialogue with them. Understanding their needs, desires and expectations. Do not talk about your product. Talk about what it would do for your customer. The main question companies need to be asking while thinking about social media to choose the right platform is where their audience are. If your customer base is active on your Facebook page or groups within your industry, then it does not make sense for you to be active on twitter (unless ofcourse you have active customer base on both). Modi and BJP had used a lot of slogans to get into peoples’ minds. Most of them were simple. Some were unique. Minimum government, maximum governance became so well known that media was using it as headlines and captions. It clearly shows what Modi has plans for the Government and how to run it in a huge country like India. Abki baar, Modi Sarkar, meaning It Is Modi’s Government This Time, developed by the advertising agency Soho Square, was considered the most widely spread slogan of this campaign. It appeared on the buses and shops, banners and holdings, media and radio and everywhere it can. It went so deeper into the people that even the most remote villages and locations were chanting this slogan. Not just these mass media engagement tactics, but Modi and BJP had even devised localized tactics. He developed a consistent tone and structure for his speeches — starting with addressing the people and telling them they are important and glorious, then addressing the local problems they were facing, then comparing them with Gujarat, then pointing out that Congress did no developmental activities and then promise that he will work for them and their development if given chance. He talked about the plight of farmers in some states whereas he addressed immigrant problems in the other, economic backward in one and infrastructure in another, depending on what the people want. In the world where story telling became an important part of branding, companies need to be consistent in their communications with their customers. Let us talk about blogging, tweeting and other forms of content marketing here. Why do your customers come to your website or follow you on twitter or read your blog? For the insightful content that you share, the tips you give or the information that you provide. It is quite important, under those situations, that you retain your visitor with consistent content and its quality. If you miss a week or two, it is fine. But if your visitor does not find content on several occasions, or finds that the quality has deteriorated or you are talking about too many unrelated topics (this might or might not apply to personal branding, consultants or writers — like me but it sure applies to companies), it takes a single click to unfollow you and another click to follow your competitors. Oh you do not want that, especially with lots of choices customers have these days. You have to provide consistent quality and value to your customers through your content. What Narendra Modi has successfully achieved is a fan following. Youth and women mainly. It was estimated that women comprised of almost 55% on an average of the people attending his rallies or events. Youth was the backbone of the whole campaign of Narendra Modi. They volunteered on mouth-to-mouth marketing. They stood behind the technological marvel seen in Modi’s campaigns. They extensively shared and spread the word on social media. The branding of himself as someone who gives development the priority have resonated well with the youth and women. They became the advocates for Narendra Modi, BJP and their campaigns. Many companies, from Apple to Ford, from Coca Cola to Zappos, have clearly proved the power of early adopters of their products who go on to become advocates of those companies. Amazon gives several offers to its customers like trying out different products for free as a return of a review and then keeping the products to themselves. These customers, who are either given offers or who are the early adopters of the company’s products, are the influencers who bring new customers to the companies through mouth-to-mouth marketing. Turn your product’s early adopters into your brand advocates with excellent service and offers. If those advocates are socially looked-upto individuals, it adds weight to the company whom they support. This was seen in Modi’s campaigns too. Film celebrities openly declared their support to Modi. Even most of the news networks have subtly declared their support to Modi. All these had resonated with the people, especially the celebrities who are the influencers for their fans. These influencers of any company take it as their responsibility to support the company. But companies should also take care to focus on these influencers and give them the best customer service and provide value to them to retain these customers. It has been proved time and again that retaining an existing customer is far more cost effective than attracting new customers. Retaining customers is far more cost effective than attracting new customers. Note: Some of the facts and figures in this article have been taken from media and public sources. You can find the complete list at the end of part 3 of this series. That being said, why did I choose to write this post? Being a management professional and a writer, I find it fascinating to learn business practices from other non-business aspects of life. It could be from writing books (as a writer, I have realised finishing a book is nothing short of running a company), from traveling or even from what the city of San Francisco had done for Miles ‘Batkid’ Scott. Likewise, the recent Indian General Elections 2014, which have seen a tectonic shift in the political platform of India, the largest democracy in the world, stirred some thoughts in my mind. The election campaigns by both leading national parties BJP and Congress and the precise planning and outstanding implementation shown by Narendra Modi, the Prime Ministerial candidate of BJP, have mirrored the factors that play quite an important role in deciding the future of businesses too. In this 3-posts series, I will discuss 10 key aspects of business and the lessons that today’s companies can learn from Indian General Elections 2014. Businesses have long ago identified the importance of branding. From Ford, General Electric and Coca Cola to the newbies Google, Facebook and Zappos (ok not so new), companies have used branding as the most important tool for marketing. They have identified the need to enable customers distinguish the company’s products from those of its competitors. The customers should think of the company and its products as soon as a need arises in their life; just like someone who wants to find information about something might automatically go to Google or Wikipedia today. Narendra Modi, the present Prime Minister of India, has understood the importance of branding. With several taglines and slogans that filled the people with excitement, thoughts and expectations, Narendra Modi has branded himself and his party BJP as someone who would work towards development if elected. That was his branding strategy. A promise of development. He talked about development and nothing much but development. His primary slogan was ‘Minimum Government, Maximum Governance’ which clearly conveys his brand. Any company needs to be consistent in its brand image, interactions with customers and products they provide. If the company deviates from its brand image, it causes confusion in customers and could easily lose them to the competitors. Once a company decides on its brand image, there is no going back; at least not in 90 percent of industries. It is quite important to identify who its customers are and what are their values and aspirations. Mark Twain said, ‘Sell yourself, not your content’. Exploring customer emotions and showing empathy thereby connecting with them is the key to effective branding. Brands are more understandable than technical parameters. They get rooted into the customer minds. They are appreciated on a psychological and emotional level which is far stronger than being related to on a rational level. Branding ensures the company stays at the top of the customer’s mind and often proves to be the most powerful weapon in the company’s marketing arsenal. Modi tapped into this psyche of his audience. Even though there was constant reminder about the particular developmental activities his Government would do for a particular section of people on geographic or demographic fronts, Modi has underlined all his speeches and discussions with the promise of development. Even for the companies, deviating from product specs is understandable until there is no deviation from the brand image they have garnered. Companies can change their product offerings but all of them should emphasize their unique brand message. For Apple, that is simplicity. For Google, that is not being evil. For BMW, that is speed and style. Sab ka Saath, Sab ka Vikaas — that was the tagline of the whole campaign of Narendra Modi. It means, ‘together with everyone, for everyone’s development’. An important contributor to Narendra Modi’s success was the inclusion of everyone in his campaign. He had successfully involved the youth who constituted the 1.5 Million newly registered voters in India in these elections. He had also conversed with often overlooked segments of the people such as tea sellers. For decades, Indian politics have focused on castes, religions and backward sections. But Modi’s campaign focused on the holistic development of the country. His goal was to address the aspirations of everyone rather than just a few focussed vote banks. He included everyone, from businessmen to farmers, from Indian growing middle class families to tea sellers, from people waiting eagerly for better roads and schools in villages to the youth dreaming of jobs, industrial growth and bullet trains, everyone. While the total electorate in Indian General Elections 2014 was 814 Million people, direct interactions by Narendra Modi were with 234 Million people (This does not include mass media campaigns through TV, radio and print media)(Rahul Gandhi, the unofficial prime ministerial candidate of Congress, interacted with 13.3 Million people only). He focused on what all these Indians wanted — development on all fronts. This is one of the most important criteria companies have to look at when communicating with their customers or prospects. ‘What is the #customer looking for’ is the most important question. Another way companies can be inclusive is by enabling its employees involve in decision making. Many companies take the branch or store level decisions in the HQ where they have limited knowledge about the demographic and cultural characteristics that the employees face in local markets. After all, every market is different with complicated market dynamics at play and customer behaviours changing frequently. Such decisions would prove to be futile if employees on the front line are not involved and their input is not valued. This has been seen in many industrial companies such as steel, iron and other similar industries. Nucor was one such company who introduced effective employee engagement programs in steel industry in the USA. A company that I like today is Zappos. They have recently removed job posts from their careers website. They never tweet about job postings, not even one. They introduced Zappos Insider program to interact with potential employees and whoever is interested in learning the inside stories of the company. Apple is another great example with its Apple stores and customer experience they provide. Many companies are looking at ways to include employees, customers and communities in their decision making. After all that was one of the criteria for an efficient CSR activities of any company. Including everyone, developing them and thus developing the company is becoming a new norm. And that is what branding should exactly be. We see companies use modern technology through out their operations. But still, there are several businesses, especially small and medium scale, who undermine this resource. Technology today is not a mere choice anymore. It has become an essentially important resource that you need to tap into if you want success. That was what we have seen in these election campaigns. Collection of the big data and analytics was the central criteria for planning of Modi’s campaign. Tech savvy team formed by brilliant minds in engineering and analytics have monitored all the campaigns undertook by other political leaders from Congress, incuding their speeches and what they had said about BJP and Modi. Then the important quotes were communicated to Modi to which he would respond in his next event. Speech on telephone, a feature where people can listen to Modi talk live by dialling to a particular number, was launched on September 15, 2013. On January 1, 2014, India272+, a mobile app was launched on Google Playstore. A fleet of GPS equipped vans drove to villages in Uttar Pradesh and Bihar states and showed Modi’s speeches on 55 inch LED screens. The most innovative was using 3D holograms to deliver speeches in some locations. Modi had already won a place in the Guinness World Records for delivering a speech to 53 locations simultaneously in Gujarat Assembly Elections in 2012. This time some BJP supporters had even tried to approach Modi without realising it was just a 3D hologram but not Modi. Technology has ventured into every aspect of our life. Logistic companies are looking at drones to span the distance in minutes that would otherwise take hours. Technology companies have waged a war against each other to innovate new products that would solve otherwise impossible tasks. IBM’s Watson is an example of where todays technology might take us to. Driver-less cars are just around the turn and the days of Robots cleaning and cooking for us are not far away (unless they decide to go all Terminator on us and take over the world). With such advents, technology has also become a prime deciding factor in todays competitive markets. If your competitors aquire new technology or develop their own, then you have to realise that you are dragged into the race whether you like it or not. Technology is not a resource anymore. It is deciding factor irrespective of your industry. Modi had successfully used the power of social media. From the day the elections were announced to the day the polling ended, 29 million people did 227 Million interactions regarding elections in India on social media. 13 Million People have engaged in 75 Million interactions about Modi. Facebook sent an alert to vote on each day of polling and over 31 Million people saw it. With such a huge amount of people active on social media, Modi had took a right decision to use Social Media in his campaign. So effective was it that when Modi had won the elections as the results came out, his photo with his victory wall message had generated more than a million likes and shares. More than 13 Million YouTube videos have been downloaded. 15 Million Facebook likes and 4.37 Million Twitter followers. 10 Million Volunteer base with 2.5 Million actively participating throughout the campaign. SMS texts, WhatsApp texts and voice calls have been made to 130 Million people. With so many people being actively interacting and engaging on Social Media across the globe, it provides the companies the easiest platform to connect with their customers. With so many people engaging, #socialmedia is the easiest platform to #connect with #customers. Potential employees are checking out company cultures on Facebook and Twitter. Product details are being leaked on social media before their official release to spark interest and gauge reactions. But merely being present on social media and posting on Facebook once a week and tweeting once a month is no longer sufficient. Even the company’s customer service culture is clearly analysed on social media. The recent scandal of inappropriate image tweeted by US Airways in response to a customer’s concern is an example of it. Social Media is the new approach to customer experience both customers & organizations embraced. Social media is THE most influential medium to connect with the customers and engage with them. At the same time, choosing the right platform is crucial for the companies. They should identify where their customers are primarily hanging out and should be active there. But again, companies should not drown customers with ads or marketing material. They should instead try to have dialogue, solve problems and confusions and provide value to customers. Zappos is again a company that has identified the value in this. Nike, Coca Cola and Yahoo are also showing what social media is capable of in connecting with their customers. Please read Part 2 here. Please read Part 3 here. social media - is it making our connections worse or...? How the social media is bringing us closer to people yet making us far from them? Digital communications and social media. Facebook. Emails. Short messages. Whatsapp and other chat apps. We have a wide variety of communication channels these days to stay in touch with our friends. Stay in touch. That’s a grey phrase. Are we really close to our friends with all these tools? Are we always there for our friends, when they need us, to sit with them and share their joys and sorrows, give them a shoulder to cry on? HeadsUp: You might find this article as anti-social media or against modern technology. I assure you I strongly believe that all this modern communication channels are enriching our lives and bringing us closer to people. However, some concerns still prevail and I intend to address them. I am a strong practitioner of social media (I am a marketer and it is a major part of my job and life alike) and in no way condemn the technology. A few years ago, that is when I was a child and we did not have much of this modern technology or smart phones, a normal day was more like this. Getting up early, with the sun shining through our windows, wishing our parents a good morning and may be pray to God for a while. Snatching the sports or cartoons page from the newspaper in dad’s hand and laughing at those strips. With mom yelling that we are getting late for school, or wherever we had to go, we used to run shower and dress up hastily to catch the bus. Now the first thing we do after we wake up in the morning is check our phone. (I admit I do that too) And we wake up with the alarm in the phone. We check news, friend’s social media status and tweets on our smart devices. All this while eating. We just nod at the breakfast table and again get immersed in our virtual world. I do not know how many of us still receive printed newspapers at home. I sure do not. Distraction. A common illness for many modern-age youngsters according to several studies. Even with so much advanced technology, digital devices, and the world at our fingertips, we are more easily distracted now than in previous years. Why? Our attention span is being deteriorated. Every other minute, we pull out our phones to check if a text had arrived or someone had tweeted. We do that when we are travelling in bus. We do that when we are waiting for food at a restaurant. We do that when we are walking on a cold evening along the street. We are filling these gaps, gaps of boredom, solitude, loneliness, with this type of behaviour. End result — we are missing out on moments- moments to reflect, moments to think, moments to let our brain go on a walk. Sitting next to an old man and sharing his experiences, talking to a beautiful girl and trying to flirt with her, or laughing at the faces a 5 year old might be putting up — these are some things that we used to do back then- when digital world was separate from real world. When we get onto the bus or tram now, we do not notice other people. But if we do, I am sure we would see that everyone is looking into the screens in their hands. When we talked, we used to listen. Not hear. Listen. Take in each word. Notice each expression. Understand each emotion. In short, we were connected. Even now, we are connected. But differently. How often do we really talk to someone? Or even better question: How often do we really Listen? Taking in their words is not listening. How often do we empathize with them? Think by putting ourselves in their shoes? Understand their emotions. We still do that, may be, at least some of us do. But not totally. We chat. Online. Apps. Messengers. At a time, we chat with 2, 5, 10. I am sure even now there are at least 2 chat windows open on your device as well as mine. This is one nice video from the Big Bang Theory which has little to do with this topic yet adds something to this piece. We stay connected with our loved ones (parents, siblings or life partner) all the day that when we come home in the evening, we miss that enthusiasm of missing them all day. We do not run and hug saying ‘I missed you, honey’. Instead, we pick up the topic which we had left talking about on a chat app or a messenger. Now, I find it a benefit actually. To stay connected to loved ones however far we are or however busy. But I cannot say I do not miss those moments of meeting them after a long day of wait. Modern day technology, connectivity, and devices offer us a lot. Both good and bad. Like every other thing in life. What we choose depends on us. It might come as a surprise, or may be not, that the startling figures of people suffering from illnesses, anxiety disorders, mental imbalances arise due to constant connectivity which, on other hand, is saving a lot of lives and making many live better. As with every technology, it is we, finally, who has to decide how we want to use it. I might come as anti-digital era person. But I assure you, I am not. I have an ultrabook, a tablet and a 5 inch smartphone. I am always connected. I chat a lot. I do everything I criticised above. True. But I also, at least, try to take time for my friends to actually be there for them and support them. I hope you do that too. Coincidentally, the day after I posted this article, Meghan M. Biro tweeted about this video http://t.co/X20B5oDYDs. It talks about how we are opening our computers to the social media and then, shutting our doors to the world. Meghan is the CEO of Talent Culture and a contributor to Forbes, Huffington Post. She is one of the top ranked leadership and social business experts on Twitter. If you like this article, please share it to your loved ones to remind them life is more than social media. Take care. Thank you.